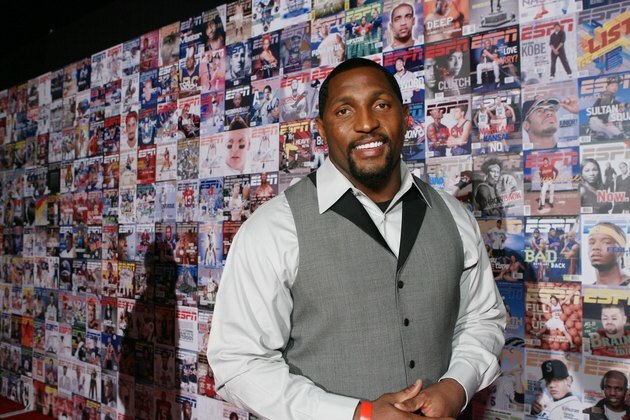 From 1996 through 2012, Ray Lewis was one of the best and most feared linebackers in the National Football League. He was the NFL Defensive Player of the Year twice, a first team All-Pro selection seven times and was chosen for 13 Pro Bowl games. Lewis attributed his success, in part, to his work ethic and intense workout routine, which combined old-school exercises with his own innovations. Lewis’s workouts are intense, but not purely scientific. One of his training methods -- which he began as a boy but was still following as a pro -- was to pick cards out of a deck and perform pushups in accordance with each card. If he drew a 7, for example, he’d do seven pushups. A face card was worth 10 pushups, an ace 25 and a joker 50. He’d proceed through the entire deck, shuffle the cards and then do the same workout, but with situps. In his NFL days, he went through three decks of cards for each exercise. Lewis preferred functional exercises with athletic applications to working on machines. One of his staple workouts involved running on sand while wearing a 45-pound weight vest. The warmup included 100 jumping jacks plus 100 squats, while wearing the vest. He’d then space three cones 10 yards from each other along the sand and perform a variety of sprints. For example, he’d line up 10 yards in front of the first cone and sprint to the cone, back to his starting line and then return to the cone. After repeating the exercise four times, he’d perform five 20-yard sprints and five 30-yard sprints. When Lewis left the beach and hit the gym he preferred dumbbell and body-weight exercises. A sample workout may include four sets each of incline and flat-bench presses, shrugs and rows, three sets of lying triceps extensions plus two sets each of front and lateral raises, biceps and cross-body curls, hanging leg raises and hanging oblique crunches. Lewis performed each set to failure. Lewis performed 60-minute workouts at least three times per day, five days per week during the offseasons when he played in the NFL. He put in about 90 minutes of rest between sessions. He performed abdominal and core workouts each day -- for example, he did between 2,500 and 3,000 ab rollouts per week, using a steel ab wheel. He also performed plyometric bounds.